Every once in a while I have one of those magical moments where light, circumstance, and technology come together to result in a great image. 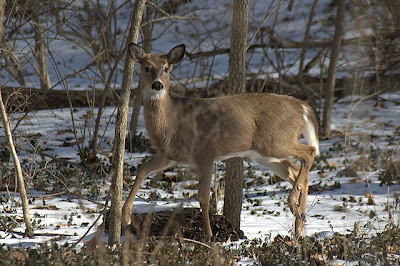 Although there are dozens of deer along the Olentangy River corridor here in Columbus, they are extremely weary of people and tough to photograph. That was until yesterday morning, when I finally got some decent shots of the elusive Odocoileus virginianus. I am certainly lucky to live so close to a natural area, especially since Megan and I live in the City of Columbus. Yesterday morning I was walking along down the river to the south towards the end of the park. In this area, there are some gigantic 80 year old homes built high up on the bluff overlooking the river. Their grassy yards continue down the bluff to the water. I approached the homes and all of the sudden several creatures came bounding towards me. I'm thinking, damn, I've got some dogs on me, but then they stopped and froze rather un-doglike and perked up there ears. "Ahh...deer" I thought to myself and I breathed a sigh of relief. My blood pressure shot right back up though, because once I realized that I wasn't going to get attacked by dogs, I realized I had a great opportunity to finally get decent deer images. In total, there were four young animals, all fairly healthy looking. After ther deer grew accustomed to me and went on their way, I turned around and headed upstream to see if I could catch a great blue heron fishing. 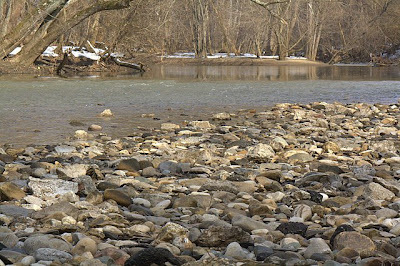 No luck with the heron, but the river has finally lowered enough for me to get out on the cobble bar that I fish from during the summer. Again, signs of the city can be seen, with several weathered and rounded asphalt chunks mixed in with the Delaware limestone, shale, glacial erratics and chert. 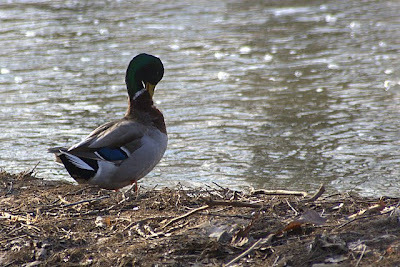 Mallards and Canada geese are the waterfowl to be seen on the river right now. I'm sure that come spring, a few wood ducks will pop up here and there. This female mallard is resting on a bar covered with water willow (Justicia americana), which I was happy to see is starting to green up. Yet another sign of spring. 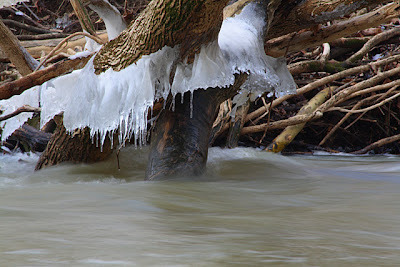 The gravel bar provided plenty of interesting photographic opportunities, including this ice formation which I shot across the river with my telephoto lens. I used a tripod and a very slow shutter speed to blur the motion of the water. My position at the gravel bar was fairly birdy. 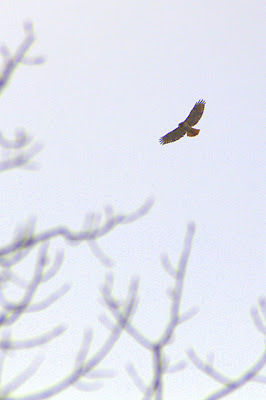 Not only did I capture the mallard images, I also had a red tailed hawk cruise above me. 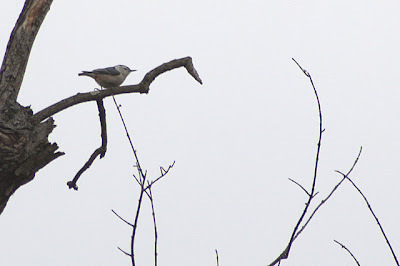 And to the north, a white-breasted nuthatch was twitting about the uppermost branches of a streamside silver maple. On the opposite bank flicking in and out of washed up tree branches was this tiny wren. This is what I call a "documentary" shot. 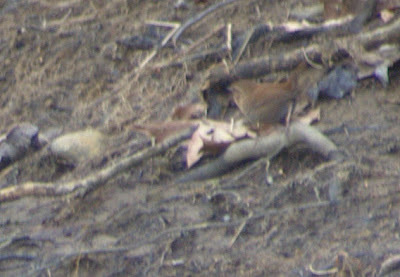 A crappy picture none the less but maybe someone could get an ID from this? I'm speculating this may have been a winter wren. Any other thoughts? And finally, several American robins were perched in the leafless Amur honeysuckle shrubs (Lonicera maackii, a really nasty invasive species) that cover the floodplain. 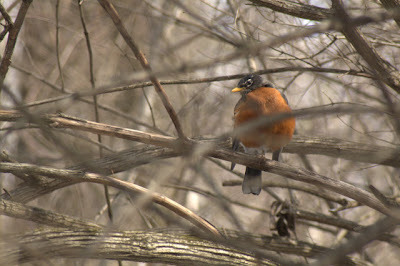 Here in Columbus, robins are with us during all but the harshest winters. I hope you enjoyed this Saturday morning walk. I ran into our deer again this morning, too. I was pleased that they let me sit and watch them for a while, before walking off. I feel I've intruder into their space if they go high-tailing it off. By the way--my peepers are screaming tonight!!!!!!! And I saw tons of red-spotted newts in a shallow pond near here today. Tonight --flashlight in hand--going salamandering. I just love your series of photos and what a wonderful day you had with stunning pictures! Thanks for sharing this with us! From what I see here, you hit the jackpot with the animals you saw and photographed. It should be a nice warm day today too. Maybe even more photos. Seems like everyone is going on nature walks and sharing their photos. I love it. 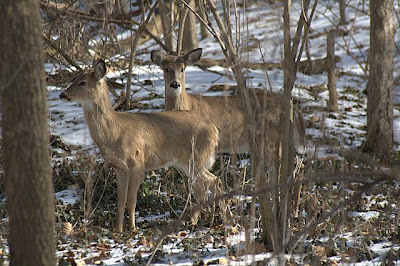 Great shots of the deer. My vote's for Winter Wren, too. It would be extremely unlikely for you to have a House Wren, and Carolina Wren, the only other option, is fairly obviously patterned. Great shots. I wish I were seeing so many birds on my walks! Very pleasant, except for the danged dogs and I LOVE dogs. Your deer pixes are indeed lovely and OMG! I just read Nina's comment. Screaming Peepers!! Ahh..Wow, amazing but I guess it is true. My peeper post really did fore tell of what was to come, and come it has! 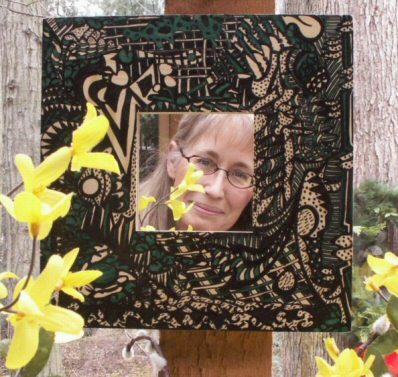 I need to go out tonight to listen for peepers, although I'm not exactly sure where I can go to listen without a permit at night...I need to think about that. I love newts. They are fantastic. I doubt any populations are left in Franklin County, but you never know. Let me know what you find, I can't wait. You also could have some Tiger salamander populations where you are, I would guess. Monarch- Thanks a bunch, I'm glad you enjoyed these images. Toni- Thanks a bunch. I need to check out everyone else's posts. I've been busy planning for my Florida trip! Seabrooke- Thanks for stopping by and commenting. I definitely appreciate it! Feel free to drop by anytime. I wish I had my binos to take a look at the bird, but it was too small for a carolina. It really behaved like a winter wren, staying low and twittering about. The eyeband has it. Winter wren. It's suspect for a female Carolina, but at this time of year (breeding plumage), the eyeband of even a female Carolina would be almost bright white. As seabrooke suggested. But...this same picture of a September/October bird, it would be a toss-up! Thing- Thank you very much. Again, I'm really enjoying your blog! Looks like a lovely walk indeed! I agree w/Winter Wren, although a wren expert I am not! Looks too plain and buffy to be any of the other wrens I'm familiar with.